Gouverneto Monastery or Our Lady of the Angels is a Greek Orthodox monastery in the Akrotiri cape of the Chania Prefecture of Crete, located about 5km north of the equally stunning Agia Triada Monastery. 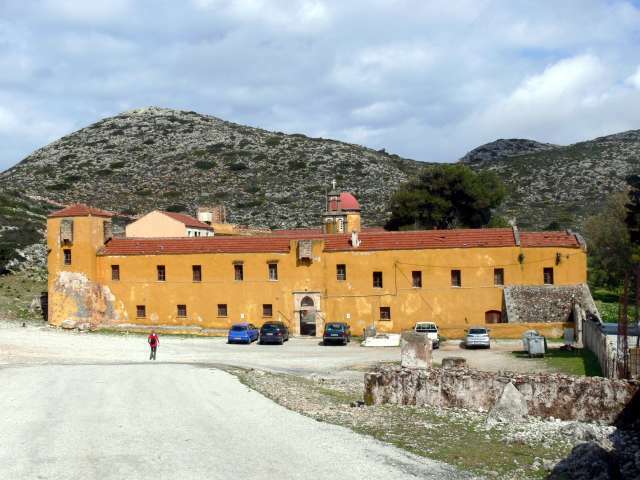 Dated to 1537 (although other sources say 1548), the monastery is a Venetian style fortress with towers at each end and some Baroque influences added later. It measures roughly 40 metres by 50 metres and contains some 50 monks’ cells on two floors. It is reputed to be one of the oldest monasteries in Crete, and a 1637 census, recorded shortly before the Turkish invasion, revealed that at the time there were 60 monks living in Gouverneto Monastery, also making it one of the largest in Crete at the time. The courtyard is rectangular shaped and is dominated by a dome church dedicated to the virgin and has an ornate Venetian facade. The chapel in the courtyard is reported to have some of the oldest frescoes in Crete. To the west side of the monastery is the narthex, and contains chapels dedicated to St John the Hermit and the Ten Holy Martyrs. There are some notable monsters carved in relief on the front of the church. A cave called Arkouditissa or Arkoudia, is also located in the vicinity where the goddess Artemis was once worshiped. During World War II, the Germans established a guardhouse in the monastery to regulate the area and since 2005 it has undergone restoration work by the monks. The monastery has strict rules, and forbids smoking and photography insde the monastery and is officially closed on Wednesdays and Fridays.